The midway point of January has passed. That means most people’s well-intentioned resolutions have already fallen by the wayside. Sticking to a resolution is hard. For busy business owners, it’s even harder because, well… you’re focused on running a business. We get it! We’ll skip the treadmill to meet with a new client, too. As a leading provider in equipment financing, we have a unique perspective of what a “healthy” business looks like based on the hundreds of applications for equipment financing we review. If your 2019 business resolution is to create a “healthier” company, consider following these tips. Changes in Section 179 of the Internal Revenue Service (IRS) tax code took effect last year, which allow you to deduct from your gross income the full amount of equipment financed through a capital lease in the year you put said equipment into service. You get the immediate deduction versus having to depreciate its value over years. If you have long thought having a certain piece of equipment would boost your company’s productivity, sales, profit or a combination thereof, 2019 may just be the year to finance it through a capital lease. After 2022, the law will change. For business owners with less-than-perfect credit, the fear of a high lease payment can keep them from investing in equipment that actually could grow their business and generate profit above and beyond the payment expense. Take a look at some numbers we ran to illustrate our point here. Business ownership comes with taking risk. However, some risks are a no-brainer, especially when the numbers add up on your behalf. When you are not a corporation, lenders draw no line of distinction between your company’s and your personal credit history. The logic being that how one handles personal finances likely are the same as how one handles the business finances. Your personal credit history will be reviewed along with a financing application when you apply for equipment lease financing. There are two things you can do to prepare for the inevitable. One, resolve to improve your personal credit by following these steps. Two, work with an equipment lease financier who sees you as more than a credit score and will consider your personal character and other more positive aspects of your financial history along with the numbers on your application. Business goals are far less prone to slide into oblivion than personal resolutions. In reality, business goals you set for the year are similar to resolutions. 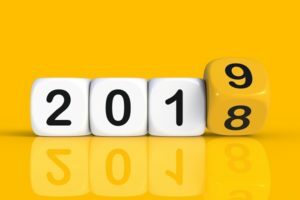 The difference is that your commitment to business resolutions can have a measurable effect on your company’s year-end success, profitability and growth. Get in touch with us if you need support or advice to help keep your 2019 business resolutions and lease the equipment that’ll spur business growth.